This will be the shortest review I have written, well shortest grammatically incorrect one so far, because this was one of the most fun, violent, almost perfect horror comedies I have seen since Cabin in the Woods. Let’s get reel and break down Cooties. …the end. This is the only complaint I have with this film. The ending felt abrupt and I didn’t feel like there was the correct closure, or at the very least an awesome build-up to a potential sequel. I also might have been angry because I was enjoying myself and I wanted more and I was having a good time. It’s like if you are at a party and the night is almost over, you are relaxed, but then the cops bust the party right as you go home and puts you in a weird mood for the night. Even with my problem with it, I still enjoyed it. Everyone delivers and it looks like they are all having fun with the material. All the comedic lines are delivered in a “B” movie style that works for the tone and that elevates the fun. This might be my second favorite Elijah Wood film behind the Lord of the Rings trilogy. The beautiful, magical thing about horror comedies is that the cinematography is always good. A horror film shoots and lights their movies with atmosphere, tension, and tone. When you have that cinematography with comedic situations, characters, and dialogue at its core, you have an awesome contrast for the story. Cooties executes that with flying colors. For an hour and half, it feels like ten minutes flew by. 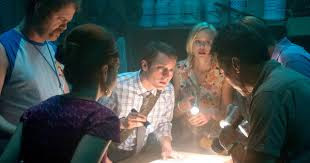 Usually horror comedies nail that rhythm and can make a kinetic film with no speed bumps, but there are some that fail and Cooties isn’t one of them. The special effects are really good, especially for a film that has a low budget. The gorgeous red colors from the flesh and blood from the violence are great contrast to the playful elementary school colors. Take this with a humongous grain of the purest salt; I am a huge fan of horror comedies and these types of gory films. I realize this film may not be for everyone, but if you love horror comedies, you will appreciate this one. I love, love, love this movie. It will be in my top ten of the year.